Take off on an epic adventure to the top destinations on your travel bucket list. 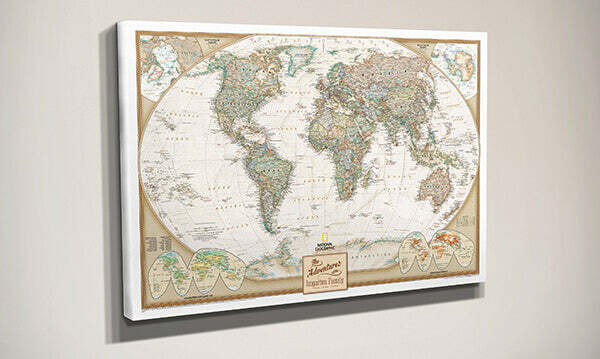 Upon returning home, pin your world travels on your very own Gallery Wrapped Executive World Map. Through a partnership with National Geographic, we are able to personalize and print this gorgeous, highly detailed map on premium canvas and gallery wrap it to create a fresh, contemporary look. 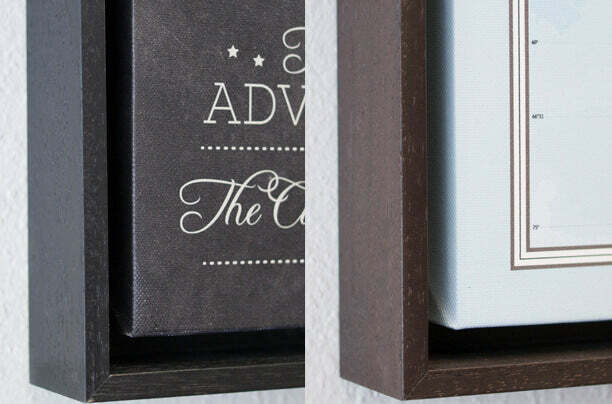 The rich canvas texture coupled with the map's antique color palette and elegant gallery wrapped frameless design creates a true work of art you will love showing off in your home, office or business. 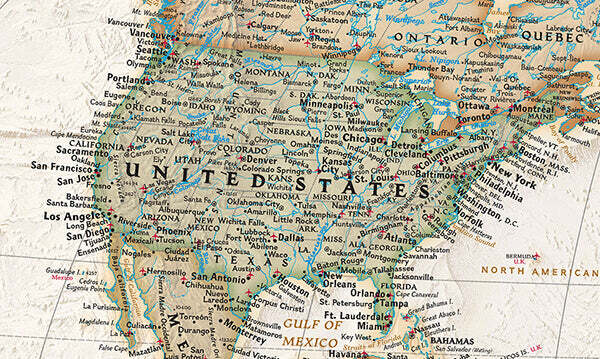 It’s easy to see why our Executive World map is one of our most popular travelers map. It matches beautifully with almost any décor! Your world pin map is sure to become your favorite conversation piece as you share stories about past and future travel adventures with visiting friends and family. Your gallery wrapped canvas wall map can be personalized with one of our 6 customizable personalization options to create a one-of-a-kind piece. Makes a thoughtful gift idea that your wanderlust stricken loved ones will cherish for a lifetime! We realize that one personalization design does not fit all! That’s why we have created 6 unique personalization templates for our gallery wrapped canvas wall maps so you can truly make the map your own! Select the option you like best from the drop down menu above and enter your text in the designated box. Keep an eye out on your email (and spam folder) the next few days in case we have some questions about your personalization. The map came out exactly as requested with my personalization requests. The canvas map feels great and the details are amazing. Looks great in our living room, highly recommended. Beautiful map and fantastic service! I ordered the Gallery Wrapped Executive World Travel Map with Float Frame as a gift and it was more than I ever imagined. My girlfriend loved the gift and we already ordered more pins. It is high quality and looks beautiful, and the customer service throughout the buying process was top notch. Brenda and Mike answered every question I had almost immediately and made sure my map was exactly what I wanted. It also arrived very quickly and was very securely packaged. I’m very confident in highly recommending Push Pin to all my friends. Thank you again! I ordered the executive world travel map for my husband for Christmas! It is excellent quality and having it personalized with our names was a lovely touch. Will highly recommend to my friends!! I was searching for the right map to get my husband for Christmas and I found it. Quality is excellent and the customer service was great!